Katie’s beloved cat, Peanut, escaped during the night, and she was worried sick about him. In her area, a mysterious string of cat murders have gone unsolved and she was worried that Peanut might be next. She desperately wanted to keep her missing kitty safe, but after realizing that making “lost cat” posters probably wouldn’t be enough, she turned to the internet for help. Even though she was already in a relationship, she created a profile for a dating app in order to reach out to people in her area! 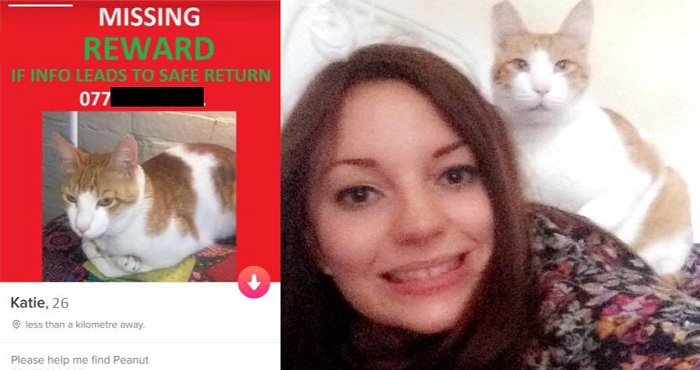 Instead of a picture of herself, she uploaded a “missing cat” image and her phone number! People in her area began to see the plea for help, and in the end…it worked! Over 400 people “matched” with the missing cat poster, which meant that all of those people in her area would keep an eye out for her precious kitty. In only a half hour, she received a response! After seeing the picture of her cat, a man looked out of his window and noticed that Peanut was actually in his garden. Unfortunately, the cat was too scared to come near. He eventually returned one week later, scared, skinny, and nervous…but he began to recover, and now, he’s as happy as ever!